Know exactly what’s going on with Network Monitoring for Windows Phone Apps at Windows Phone Developer Blog. 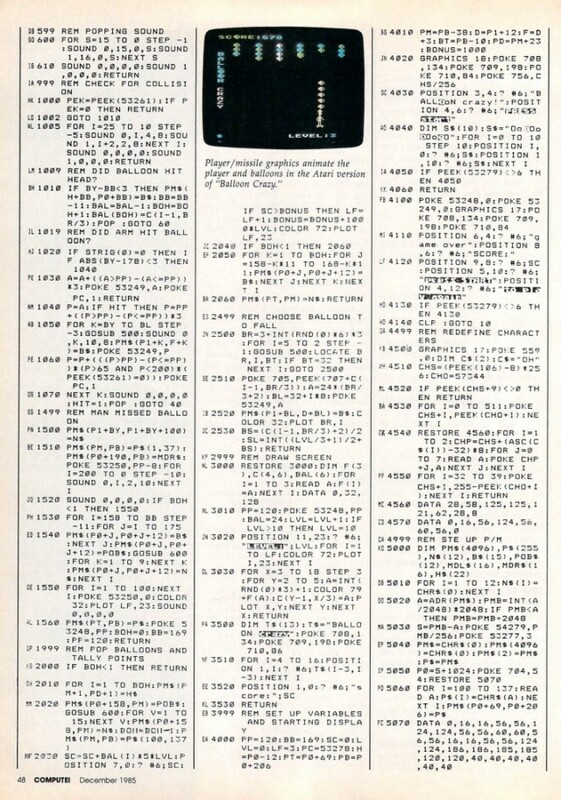 Who remembers what was the main feature of some of the computer magazines in the 80’s? Pages of long program listings that had to be typed and checked. And we also had the opportunity (and challenge) to transfer a nice program from one platform to another (we had dozens at that time). For those that lived the era of “home computers”: First encounter: COMPUTE! magazine and its glorious, tedious type-in code | Ars Technica. Code Writer is a free text and code editor app with active syntax highlighting that updates as you edit documents and has 20 supported file types. A tabbed document interface allows for quickly switching between open documents. 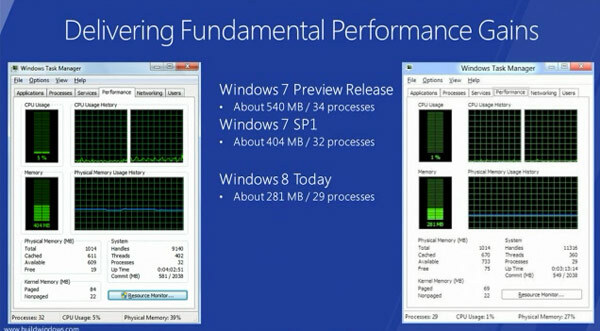 The app has been built from the ground up with Windows 8 design principles in mind. It’s fast and fluid, and gives you the power to edit documents with features you’d normally only find in desktop apps. 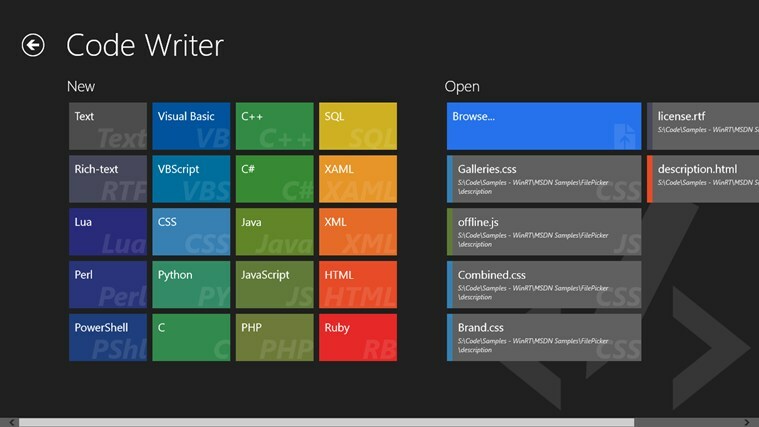 Code Writer is perfect for editing any text-based file, doing code reviews, or giving presentations with code samples. The core text editor screen allows you to edit documents in full-screen mode without chrome distractions. Only the scrollbars and line/column display are visible by default. Find/replace and advanced features like tabify lines and convert case are available. No more Expression Studio – What does it mean? The Web also allowed another platform competitor to emerge, Adobe. Adobe’s Flash, AIR, and Flex represented another serious threat to Microsoft’s platforms. Applications written using them were platform independent, and Flash itself had gained enormous market share as the only practical way to create rich media experiences on the web. Moreover, Adobe’s business model was the exact opposite of Microsoft’s. Whereas Microsoft provided development tools primarily in order to sell runtimes (e.g., operating systems), Adobe gave away runtimes in order to sell tools. Adobe also specialized in entering the application lifecycle much earlier than Microsoft, establishing dominance in the design tool space. One of the first things to note about the iPhone was that Apple made development tools available for free. At the same time Microsoft was requiring mobile developers to purchase one of its premium versions of Visual Studio such as Professional. For Windows Phone to succeed Microsoft was going to have to give away tools for mobile development. Second, Apple eschewed any kind of plug-ins for the iPhone browser and designed the rules for the App Store to ban generic runtimes like those of Adobe. As it turned out the iPhones huge success would end Adobe’s run at becoming a platform vendor. The most difficult part of testing a mobile application is to simulate problems with the network and conditions that emerge during actual use of the smartphone or tablet during real use. Until now it was very difficult or impossible to simulate network interruptions in flow of data, slow or high-latency networks under phone calls received while using your application. The new Windows Phone SDK 8.0 addresses all these types of conditions through the introduction of Simulation Dashboard. It lets you validate in advance how your app will behave in real life conditions. You can simulate various network conditions and phone interruptions from the dashboard and tweak your app to ensure that it behaves well under these conditions. A series of articles about the challenges in designing your software and what you can do in your software to insure access to those who should have access and prevent access those who do not. The intent of this series is to provide a context for you to learn more and empower you to write great applications for the public cloud. Windows Azure Security Best Practices — Part 1: The Challenges, Defense in Depth. Windows Azure Security Best Practices — Part 2: What Azure Provides Out-of-the-Box. Windows Azure Security Best Practices – Part 3: Identifying Your Security Frame. Windows Azure Security Best Practices – Part 4: What Else You Need to Do. Windows Azure Security Best Practices – Part 5: Claims-Based Identity, Single Sign On. Windows Azure Security Best Practices – Part 6: How Azure Services Extends Your App Security. Windows Azure Security Best Practices – Part 7: Tips, Tools, Coding Best Practices. Ready to try Windows 8? Τι μπορεί να τρέξει με λιγότερα resources από τα Windows 7; Tα Windows 8 φυσικά! Και για να πειστούμε ο Sinofsky φρόντισε να ανεβάσει στο http://dev.windows.com/ την έκδοση που μοιράζουν στο Build (τυχεροί οι developers που πήραν από ένα Samsung Windows 8 tablet…). Εμείς θα μπορούμε να την κατεβάσουμε από τις 5:00 πμ ώρα Ελλάδος σήμερα. Μα μεσοβδόμαδα; Αντε να κρατηθείς μέχρι το Σαββατοκύριακο… Καλό παιχνίδι!